Real-time computing systems are vital to a wide range of applications. For example, they are used in the control of nuclear reactors and automated manufacturing facilities, in controlling and tracking air traffic, and in communication systems. In recent years, real-time systems have also grown larger and become more critical. For instance, advanced aircraft such as the space shuttle must depend heavily on computer sys- tems [Carlow 84]. The centralized control of manufacturing facilities and assembly plants operated by robots are other examples at the heart of which lie embedded real-time systems. Military defense systems deployed in the air, on the ocean surface, land and underwater, have also been increasingly relying upon real-time systems for monitoring and operational safety purposes, and for retaliatory and containment measures. In telecommunications and in multi-media applications, real- time characteristics are essential to maintain the integrity of transmitted data, audio and video signals. Many of these systems control, monitor or perform critical operations, and must respond quickly to emergency events in a wide range of embedded applications. They are therefore required to process tasks with stringent timing requirements and must perform these tasks in a way that these timing requirements are guaranteed to be met. 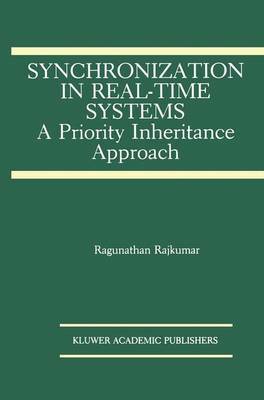 Real-time scheduling al- gorithms attempt to ensure that system timing behavior meets its specifications, but typically assume that tasks do not share logical or physical resources. Since resource-sharing cannot be eliminated, synchronization primitives must be used to ensure that resource consis- tency constraints are not violated.